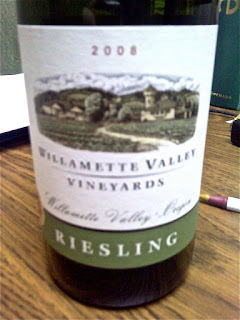 On my not too distant trip to Oregon's Willamette Valley I was really surprised at the quality of the Riesling. Well, I'm never really shocked at quality coming from this type of place or from these type of people, but I was just not expecting the Riesling to be among my favorite whites that they make. This wine happens to be Oregon's leading Riesling and is a semi-sweet style that is very reminiscent of it's German counterpart. It was fermented in 100% Stainless steel and is a production of around 20,000 cases. I will do a follow up piece on the winery because I have three other offerings from them to taste in the next few days. On the nose I get aromas of key lime, lychee nut, white peach, multiple stone fruits, red apple, white pepper, wet stone, and subtle hints of petrol. I should also mention that the wine has just the slightest spritz when you first open the bottle. This of course is very common with Riesling in general and doesn't bother me a bit. On the palate this wine is semi-sweet (4.3% residual sugar) and displays a brilliant flavor profile of sweet ripened Mexican key lime (only a guy from AZ could tout that descriptor! ), lychee, white peach, dried apricot, red apple, wet stone/mineral, and subtle hints of red pepper. I initially tasted this wine last night and I just poured myself another glass to refresh my memory. To be quite honest the wine is drinking even better today.......If your a fan of white table grapes than you'll really enjoy this wine, because I think it tastes a lot like grabbing a handful of big white table grapes and shoving them into your mouth! There is a slight phenolic grittiness that sticks to your teeth on the finish. Now whether this is just a byproduct of the high acidity or if it's grape skin tannin, you'd have to ask the winemaker. Riesliong has always been a tad sweet for me. I like the idea of pairing it with the chicken though - so shall try that. I absolutely love this riesling! I was told they do blend in a bit of botrytisized grapes. Its so good with thai food. Are you from Oregon? I love the Willamette Valley wines. I never liked white until I tried a local dry Riesling.